It may have taken 79 games to do it, but the Calgary Flames clinched both the Western Conference and Pacific Division Titles on March 31st with their 5-3 win in San Jose. The victory, which was highlighted by three first-period goals in 75 seconds, saw Calgary pull eight points in front of San Jose in the division with just three games to go. In addition, clinching the conference championship also means the Flames have earned home ice advantage during all Western Conference playoff series. It’s possible they could also have home ice in the Stanley Cup Final if they make it that far. They will take a back seat to the Tampa Bay Lightning though if the two teams meet for Lord Stanley’s Cup since Tampa recently clinched top spot in the league. The last time the Flames took a division crown was back in 2005/06 and they haven’t won the Western Conference since 1989/90, which was 29 years ago. It represents a pretty good turnaround for a team that hasn’t made the playoffs since 2016/17. They didn’t last too long that season though as they were knocked out in the first round by the Anaheim Ducks. Things may be a bit easier this spring, on paper at least, since the Flames will kick off the postseason against the second wildcard team in the West, which is still up for grabs. However, it will most likely be the Colorado Avalanche, Arizona Coyotes or Minnesota Wild. Calgary’s guarantee of top spot in the division and conference was aided by eight wins in their last 11 games and also means the Pacific’s second place team the San Jose Sharks will meet the third-place Vegas Golden Knights in the first round of the playoffs with San Jose earning home ice advantage. When the playoffs do face off in just over a week’s time, it’s unclear who head coach Bill Peters will start in net as he has a choice between the 37-year-old Smith and 26-year-old David Rittich. As for Rittich, he’s started 40 games and appeared in a total of 43. His mark stands at 26-8-5 with a 2.62 GAA, a 91.1 save percentage and one shutout. 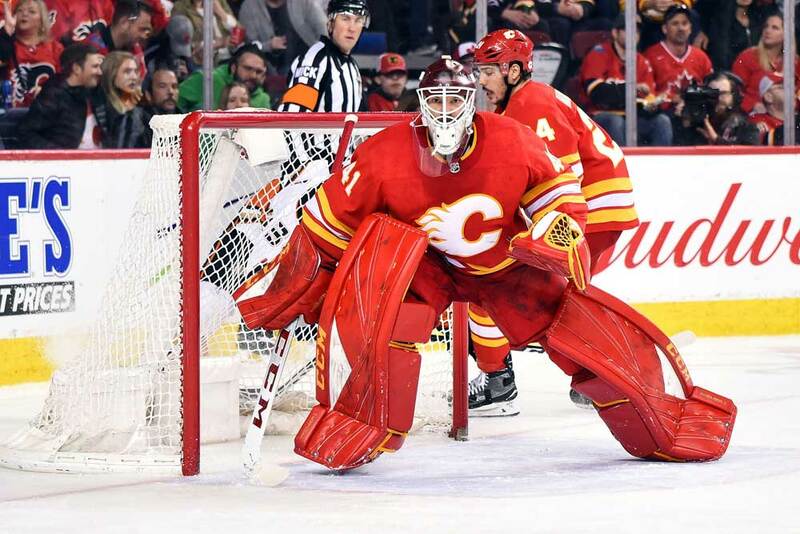 Whoever Peters goes with as his starter he’ll have the comfortable option of turning to his backup if the Flames should happen to falter in the postseason. Also, his choice will also create a debate between the team’s fans no matter who he picks. Fans are also likely to debate who the Flames’ most valuable player has been this season with the two most likely candidates being forward Johnny Gaudreau and veteran defender and team captain Mark Giordano. The 25-year-old Gaudreau may be just 5-feet-9-inches tall and 165 lbs, but he leads the team in goals, assists and points with 35, 61 and 96 respectively with career bests in both goals and points. He drives the Flames’ top line and power-play and has chipped in with six goals with the man advantage as well as seven game-winners. As for the 35-year-old Giordano, he’s notched 17 goals and 57 assists for 74 points and is second on the squad in assists behind Gaudreau. He’s a key part of the power-play and penalty-killing units and is also used to defend against the opponent’s top line. Giordano, who is a plus-39 should be a legitimate contender for the Norris Trophy this year as the league’s best defenseman and he’s just the fourth blue liner in NHL history to score at least 60 points after celebrating his 35th birthday. Overall though, the Flames’ success this season has been the result of a total team effort. Sean Monahan has 34 goals and 81 points, Elias Lindholm has 27 and 78, Matthew Tkachuk has posted 34 and 77, and Mikael Backlund has contributed 21 goals and 47 points. When adding in Giordano’s stats it gives the team five 70-point scorers. In addition, just two regular players have posted minus ratings this year with James Neal being minus-7 in 60 games and Sam Bennett being minus-6 in 70 outings. In fact, the only true disappointment this season may have been the play of Neal. He’s scored just six goals and 11 assists after Calgary signed him to a five-year, $28.75 million deal as a free agent last summer. The Flames have won the Stanley Cup just once, which came in 1988/89 when they beat the Montreal Canadiens in an all-Canadian clash. They were downed by the Habs three years earlier in their first trip to the Final and had their hearts broken in seven games by the Tampa Bay Lightning in the 2003/04 Final. The Flames will be the Western Conference favorite when the playoffs start, but it’s not going to be an easy road. They’re going to need solid goaltending from Smith or/and Rittich, leadership from Giordano and continued scoring from their forwards. If everybody chips in, history could repeat itself 30 years after their lone Stanley Cup triumph.